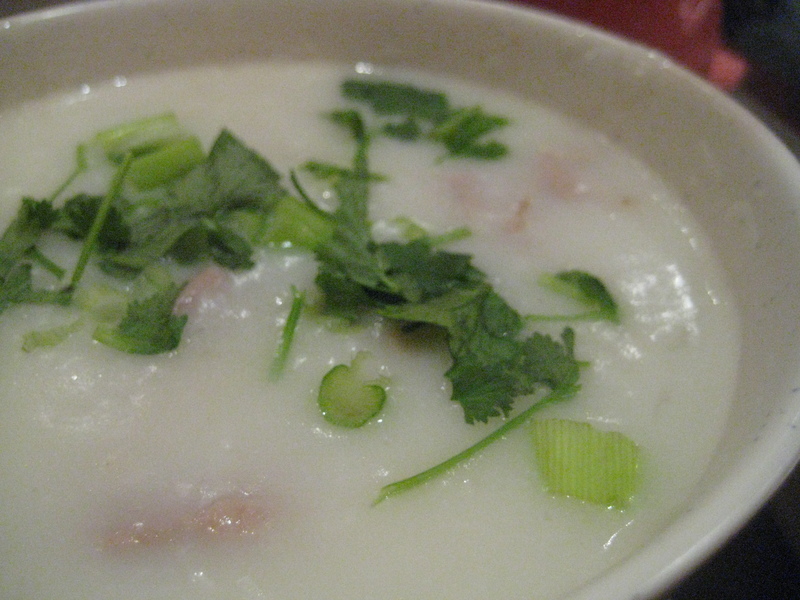 Sulking at home in today’s pouring rainstorm, I have one craving: a hot bowl of comforting jook. So I bundle up and drive over to the jook capital of Oakland, Gum Kuo, an unassuming cafe in Chinatown’s Pacific Renaissance Plaza that consistently rates first among internet foodies for best jook joint. Jook, also known as congee or rice porridge, is a staple of many cuisines, but celebrated in Chinese culture as a nourishing breakfast, perfect late-night snack or the ideal dish if you aren’t feeling well. In its simplest form, it is soupy well-cooked rice, served with side dishes as condiments, but at Gum Kuo you can choose from over 20 additions to make your porridge special, from fish balls to cubed pork blood. My favorite combo features pork and preserved egg (also known as century egg or thousand-year egg). The shiny brown chunks of what used to be egg whites deliver a silky, pleasantly chewy eggy-ness. They get that way from being coated in an alkaline clay mixture for 6 -10 weeks. 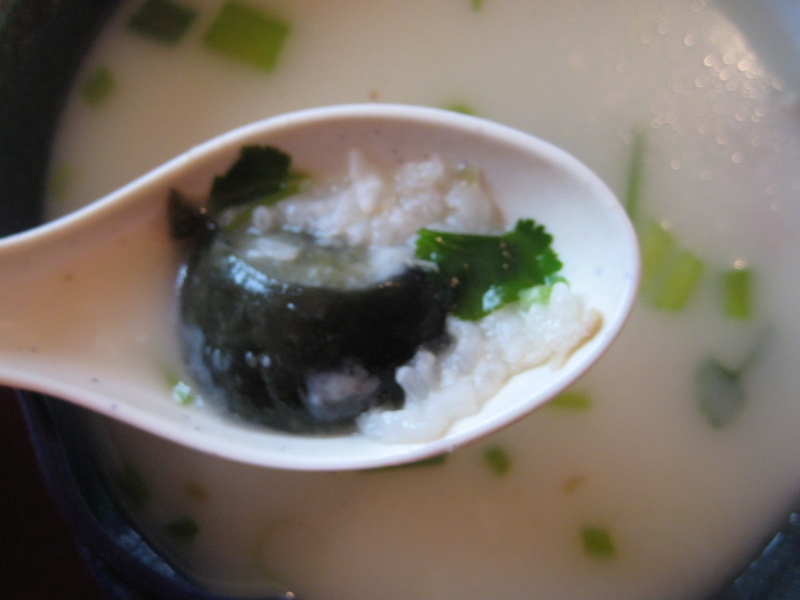 I also love jook with chicken with black mushrooms or delicately chewy abalone. Rice porridge is also a common breakfast staple in Japan; okayu is made with proportionately less water so it comes out thicker. In Korea, people line up at chain stores that sell juk. In Indonesia, where bubur is early morning fare, food vendors walk through the streets at dawn, calling “bubur”, to find customers for their wares. Because it is easily digestible, jook is one of the first foods served to babies and the mainstay of people throught the world during hard times. At Gum Kuo, my cozy moment with jook is interrupted when the room goes suddenly black due to a downtown Oakland-wide power outage. The intrepid wait staff, however, are not fazed in the least and hand out lit candles to the stunned patrons. 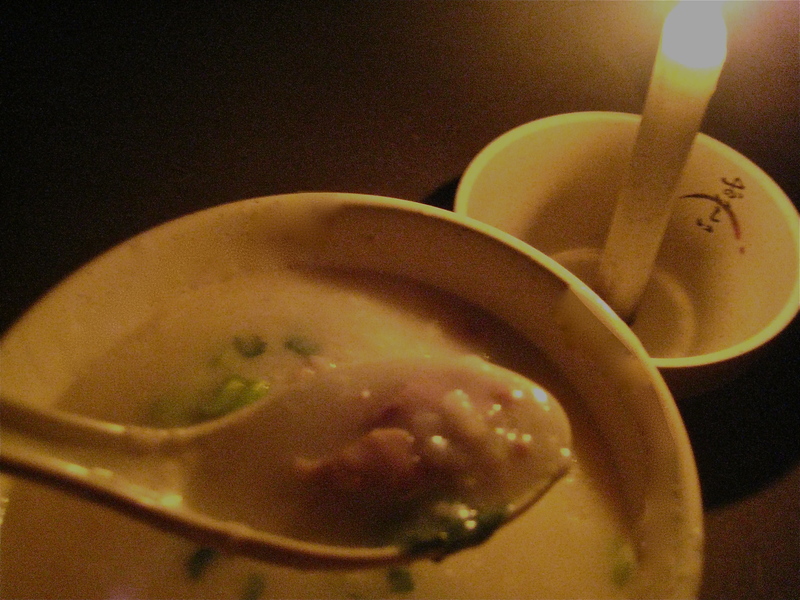 Eating my jook by candlelight, I realize that, considering the long history of rice porridge, this is probably the way it has been eaten for several thousand years (minus the plastic bowl and spoon). This entry was posted in Chinese food and tagged congee, Gum Kuo, jook, Oakland, rice porridge. Bookmark the permalink. It was a staple of college comfort food. I wonder if I can prepare jook with brown rice? Jook is an infinitely adaptable dish, so the answer is yes. I found you 3 recipes but there are tons more available on the web. Thank you Anna. Brown rice jook, here we come!